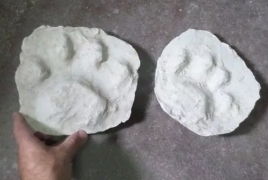 PanARMENIAN.Net - Scientists have discovered rare fossilised footprints made by a sabre-toothed tiger more than 30,000 years ago, metro reports. A team of palaeontologists made the discovery in the Miramar, a seaside resort in Argentina that’s 279 miles south of the capital, Buenos Aires. The ground-breaking discovery was found close to the current urban centre, in the heart of the tourist district. Miramar has been renowned since the nineteenth century as an exceptional location for paleontological discoveries. However, this is the first time such footprints have ever been found. Palaeontologist Federico Agnoli said: ‘In our country, we have found many sab-toothed tiger teeth but they have always been skeletal remains. Although the bones give data, they don’t tell you how the animal walked, and how it lived. The prints give much more information.’ Agnoli explained that the plains which extend south from Buenos Aires were very different to those we can see today. The landscape consisted of extensive scrub prairie and coastal lagoons. It was inhabited by long-extinct giant mammals such as the hippo-sized toxodon, ancient armadillos known as glyptodons, enormous land sloths, horse-like creatures called macrauchenia, giant rodents and birds as high as a metre tall. The palaeontologists from the University of Punta Hermengo, the Azara Foundation, the Municipal Museum of Miramar, the Argentinian Natural Science Museum, and the National Council for Scientific and Technological Research were able to extract valuable information from the prints, which are 30 centimetres in diameter.